Located on Telegraph Hill northwest of Oak Bluffs, on Highland Drive. In 1869, with the booming whaling business, there was definite need for a light to guide mariners coming into Vineyard Haven Harbor. Silas Daggett took it upon himself to build a beacon at East Chop located on Telegraph Hill overlooking the harbor. He operated it privately for seven years, receiving help and donations from local merchants for the upkeep of the light. The lighthouse burned down in 1871, but the tenacious Dagget rebuilt the light on top of his house. In 1878, Daggett sold the property on Telegraph Hill for the government to build a conical cast-iron lighthouse tower, along with a keeper's house. George Purdy was keeper in the 1920s and 1930s. He was a former lobsterman who had lost an arm in an accident in the engine room of the lighthouse tender Azalea and was famous for his ability to maintain the lighthouse and its constant upkeep and cleanliness with only one arm. 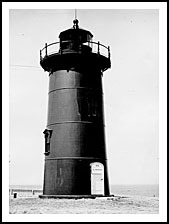 After the light was automated in 1933, the Coast Guard wanted to rent the lighthouse to Purdy for $100 a month, but he refused, so the keeper's house was removed. In 1994, the license given to the town of Oak Bluffs in 1954, was transferred to the Martha's Vineyard Museum. East Chop Light is located on Telegraph Hill, on the high bluffs near the town of Oak Bluffs on Martha's Vineyard. Oak Bluffs is a charming town that was settled in the later 1800's, with many well-preserved Victorian cottages and boasts as having one of the oldest merry-go-rounds in the country. It also is known for having one of the oldest merry-go-rounds in the country, the Flying Horses Carousel. The carousel is taken care of by the Martha’s Vineyard Preservation Trust and has been fully restored. Take a stroll around Ocean Park, which is surrounded by Victorian era buildings, or explore around Oak Bluffs Marina and watch the boats come in. As you drive around Oak Bluffs, look for the “Campgrounds” which are comprised of about 180 cottages that look like gingerbread houses, all privately owned. 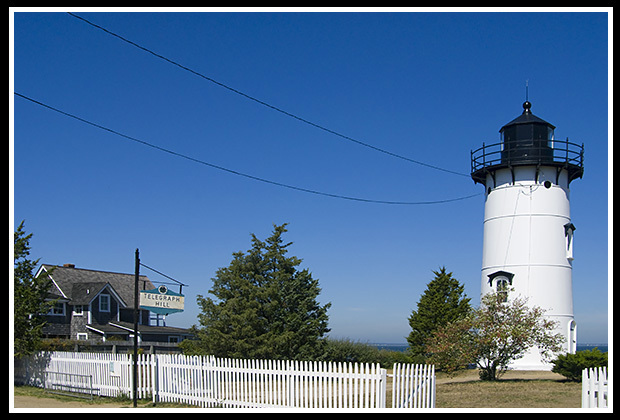 Lighthouse tours, including sunset tours, are offered in the summer by the Martha’s Vineyard Museum. Visit the Island Alpaca Farm to see these unique animals. From the marina in Oak Bluffs proceed to East Chop Road, which is on the western side of the marina. Follow East Chop Road north. The road will become Highland Drive and you will see the light on your right. From Vineyard Haven Ferry, take Beach Road toward Oak Bluffs. Beach Road will make a sharp right turn and become Eastville Avenue. Shortly after the turn, turn left onto Temahigan Avenue. When Temahigan Avenue ends, turn left onto Highland Drive and follow it until you see the light on your left. Most of the cruises mentioned below involve ferry service to take visitors to Martha's Vineyard and Nantucket Island, and between the islands. They may also offer many types of cruises, but don’t pass by the lighthouse..
Hyannis-Oak Bluffs ferry; also Nantucket-Oak Bluffs ferry. Ferry from Quonset Point, Rhode Island to Oak Bluffs Marina on a high-speed catamaran. 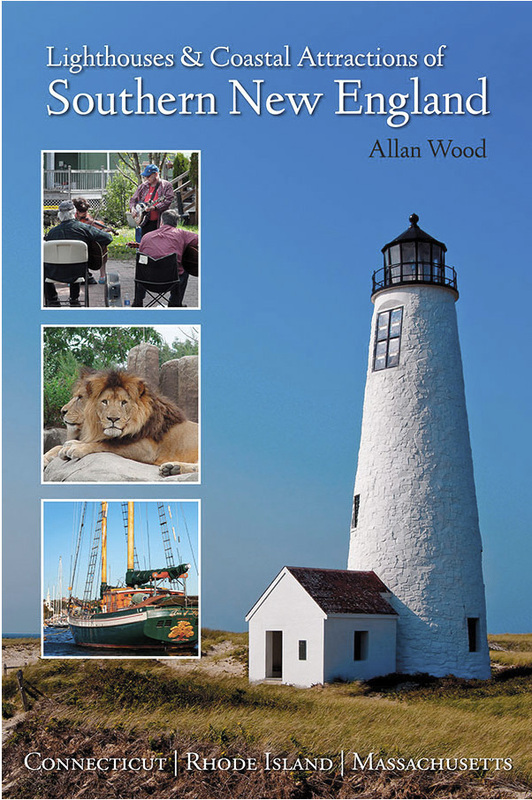 My book, Lighthouses and Coastal Attractions of Southern New England: Connecticut, Rhode Island, and Massachusetts, provides special human interest stories from each of the 92 lighthouses, along with plenty of indoor and outdoor coastal attractions and tours you can explore.